Located in a beautiful tranquil position in Kingsburgh from where spectacular views over Loch Snizort , the Cuillin Ridge and the Outer Hebrides are afforded. The subjects on offer comprises of an 2.5 acre plot and small holding (or there by, to be confirmed by title deed) which has the benefit of planning in principle approved January 2019 for the consent for the erection of a single storey or 1 1/2 storey dwelling house. The building plot and small holding on offer is located in the quiet township of Kingsburgh, known historically for being the home of Flora MacDonald after she helped Bonnie Prince Charlie escape to France after the battle of Culloden. 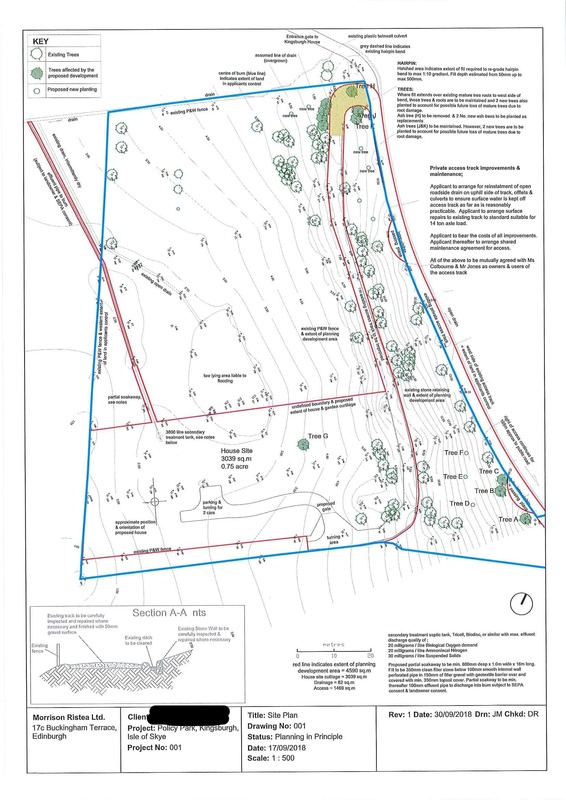 Set down a private road with a grand stone entrance with several mature trees lining the access road the site on offer extends to 2.5 acres with the proposed house site being positioned to the East and taking approximately 0.75 acres. This allows for spectacular panoramic views across Loch Snizort, the Cuillin Mountain range and beyond. The plot is not subject to crofting tenure. Viewing is highly recommended to appreciate what is fully on offer. Those wishing to view please be advised that it is currently not advised to take a vehicle beyond the stone entrance and viewing should be done on foot. Planning permission in principle has been granted for the erection for a single or 1 1/2 story dwelling house dated 11th January 2019 and is valid for 3 years from this date. 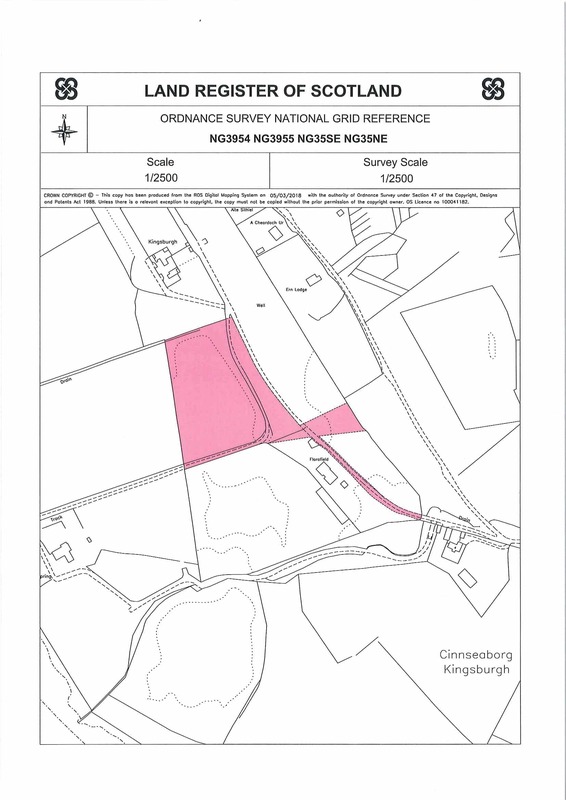 Copies of the permission can be made available on request from the Isle of Skye Estate Agency Offices and all documents can be viewed on the Highland Council Website www.highland.gov.uk, using the planning reference number 18/04610/PIP. 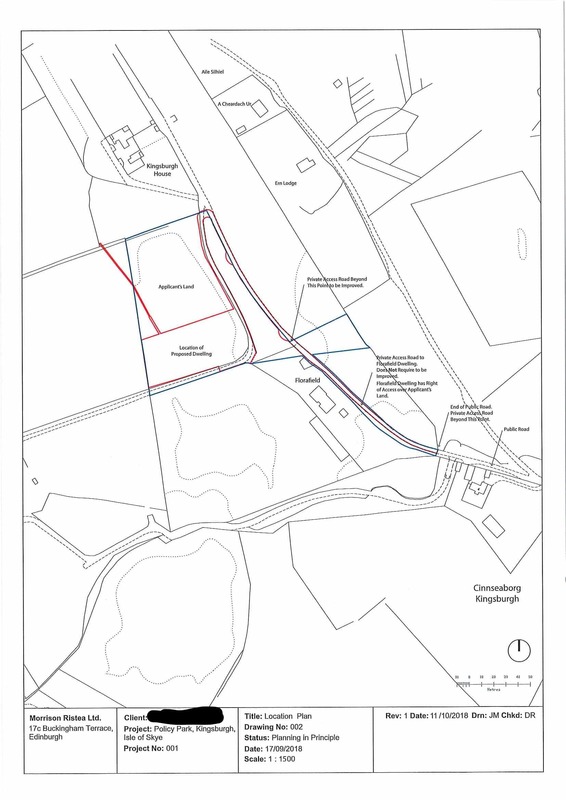 Interested parties may also wish to contact planning direct at the Highland Council. Telephone 01349 886608. Kingsburgh is a small crofting township located on the Trotternish peninsula of Skye famous for being the home of Flora MacDonald after she helped Bonnie Prince Charlie escape to France after the battle of Culloden. Views from Kingsburgh are afforded over Loch Snizort to the Cuillin ridge and beyond to the Outer Isles in the distance. Located only 10 miles from Portree , the island's capital. Portree is a busy and vibrant town offering a range of facilities and services such as supermarkets, shops, hotels, restaurants, leisure facilities, a library, a cottage hospital and modern medical centre and both primary and secondary schooling. From Portree take the A87 towards Uig and follow this road until you reach the turn off for Kingsburgh on your left hand side and take this turning. Follow the single track road till you reach a fork in the road and veer right, shortly after this turning you come to another fork in the road, veer left then continue straight through the stone pillar entrance for Kingsburgh House to the plot site, which is located on the left. Mains electricity and water is believed to be close by. Drainage will be by way of septic tank and installation of secondary soakaway. It will be the responsibility of the purchasers to satisfy for themselves those services are available and meet with own requirements. Offers in the region of £90000 are invited and such offers should be submitted in proper Scottish legal terms to The Isle of Skye Estate Agency.